Joy Creek Photo Archive (c) all rights reserved Sedum spurium is a mat forming perennial with rounded, evergreen foliage on reddish stems. 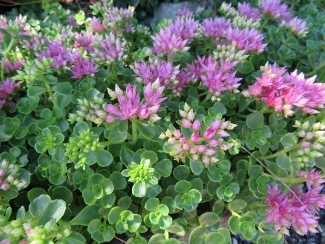 This has recently been moved from Genus Sedum to Genus Phedimus. Early to late summer. 4 in x 12 in. Vigorous, mat forming evergreen ground cover.